Farm Fresh Feasts: Does a CSA save you money? Is a CSA a good value? Whenever people hear that we do a farm share, one question I frequently get is "is it cheaper?" 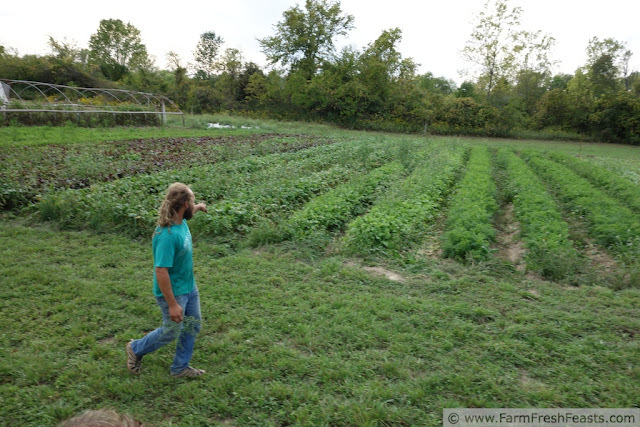 George, showing us around his farm, Patchwork Gardens. I always hesitate before I answer, because it's complicated. I mean not rocket science (though our farmer trained as a systems engineer), but it's not an easy answer for me. Each week, if I were to buy the exact amounts/kinds of produce at the grocery store's organic section or the farmer's market as I get in the CSA box, it would probably be cheaper over the course of the season to do the farm share. But would I go to the store and buy 2 quarts of heirloom tomatoes, a bunch of green onions, a bag of basil, 2 heads of garlic, a butternut squash, 2 bags of salad mix, a head of celery, and a bag of mustard greens? 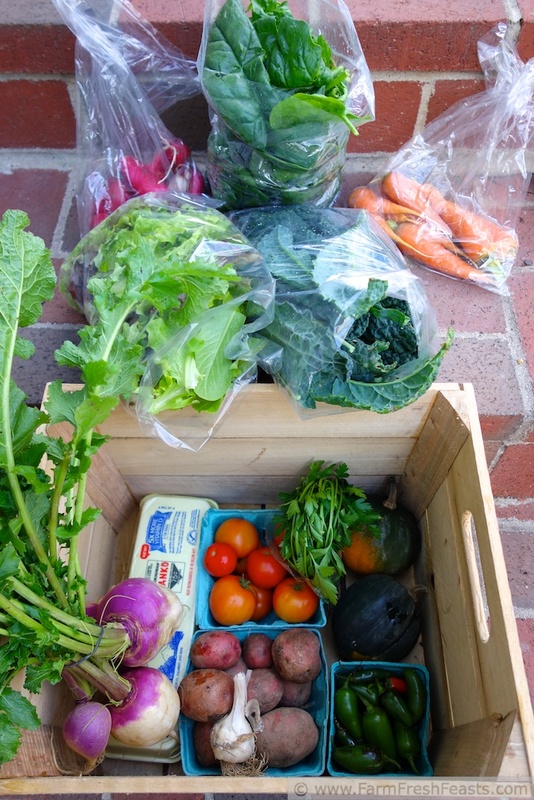 (That's a typical late summer box showcasing the transition between summer and cool season crops, and not what's shown in the photo above). Nope, I would not. Probably not even half that amount. It's 80 degrees out, for one thing, and I'm just not yet in the mood for butternut squash right now. It's September, and I'm burnt out on tomatoes and fresh pesto. However, I believe in the concept of Community Supported Agriculture. I want my kids to know where their food comes from. I want to keep farmland agricultural, not a "Planned Community of Homes from the $300's". I want to reduce the environmental impact of trucking my food from California, Florida, Mexico, South America, or floating it from China. I know that butternut squash kept in a cool dark dry place lasts for months. I want to support a local business. And, I want to eat tasty food. I choose to put my $ where my values are. So we join the CSA. We buy the large share (it's a good value). I figure out ways to put up the stuff we get, and we enjoy the fruits of our farmer's labors 12 months out of the year. Yep, I stretch that food out so we're eating it all year long. Yes, I buy additional produce, especially December-May. But what if you don't do a CSA? What if you have an amazing garden--or even just a few pots of herbs? There will come a time when you have more fresh produce than you can consume. 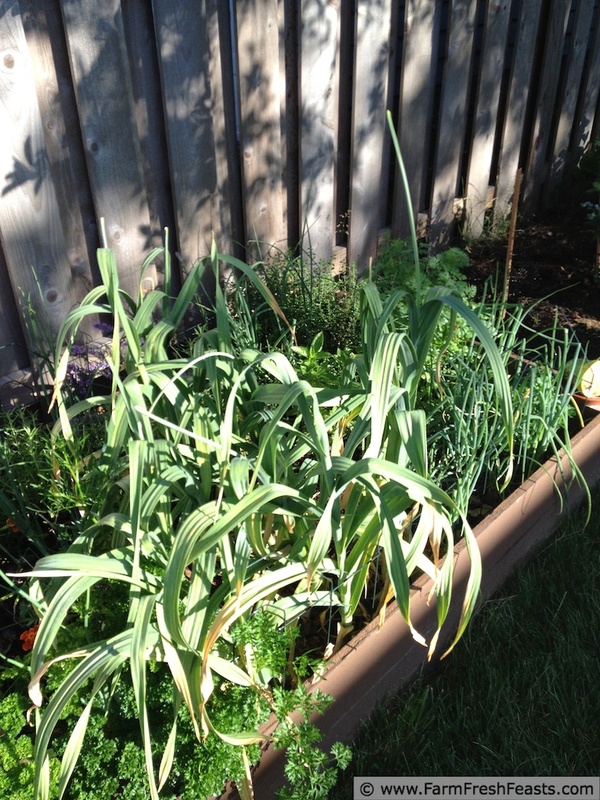 Here's my garlic bed in May/June, after I've cut back the garlic scapes and while I am waiting for the bulbs to grow a bit bigger before harvest. Unlike tomatoes or zucchini, it's all ready to harvest at the same time. Sure, you can store garlic much longer than you can store a tomato, but when you get your year's supply of garlic all at once you need options. I do 3 things with my garlic. 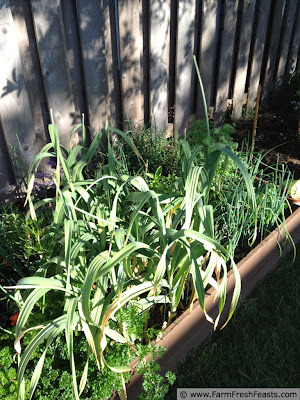 I save the biggest cloves to plant in the fall, I keep some with the onions to use fresh, and I roast the rest. Here's how! If you've got too much of anything, you can share it with your neighbors. You can donate to your local food bank. Or, if you've waited just long enough that it will spoil before you can distribute it, check around here for ideas. There's a Visual Recipe Index by Ingredient up top, and a recipe index by category to your right. I've even written a How to Use This Blog page. On my FB page I'll post photos of what's going on in my kitchen right now, with quick recipes and tips that may or may not make it up on the blog in a timely fashion. I mean, I only post recipes on Mondays, Wednesdays, and Fridays. Yet the family wants to eat all week long . . .